During tax season, I have to spend many hours doing bookkeeping, so I binge watch (mostly listen) to TV shows. the esoteric reason why so many spouses decide to not take TA-65 together…. The first show I watched was called “Travelers” and it is an ongoing Netflix series staring Eric McCormack (of Will and Grace) as an FBI agent working for a future omniscient, omnipotent AI called “The Director”. In this show, people who die are candidates for possession by future agents to come back to the present. It is strong in plot, character, and intrigue and is renewed for another season. It is very focused on the present time. 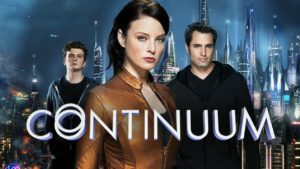 The second show I watched was called “Continuum” and was also a Vancouver-based TV show for SyFy Network and was a bit more a cops and robbers shoot-em-up series where the heroine was a stalwart dystopian cop who was send back by a megalomaniacal corporate strongman to correct the errors of his youthful past that led to the dystopia of 2077. This show plays with themes that “fate” has a plan and the simultaneous overlapping of certain characters in the same time makes for interesting drama. It alternates nearly equally between the present and the future in its storytelling. 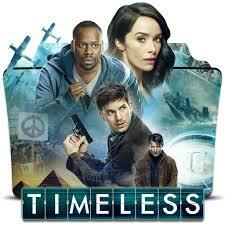 The third show which I completed tonight is an NBC series called “Timeless” and it is has also been renewed after one season. In it, characters from the present spend most of their time in the past, meeting such characters as George Washington, Abraham Lincoln, Al Capone, Bonnie and Clyde, and Harry Houdini, and materially changing the versions of history surrounding the stories of Benedict Arnold, John Wilkes Booth, The Alamo, and The Hindenberg crash. It has the highest production value and is very well cast and acted. So compare and contrast was the assignment. Here goes. 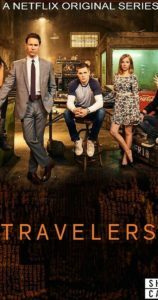 In The Travelers, focused on the present being manipulated by an opaque and dystopian future, is just now starting to explore the possibility that the loyalty to their “Director” AI may be controversial although they are all mostly still aligned with preserving their mission of keeping the time line of history sacrosanct. Factions in the future are trying to prevent The Director from being invented and for the most part, the team is not questioning this. In The Continuum, the allegiance of the lead agent clearly switches as she convincingly comes to believe that she was fighting on the wrong side of history. This is accomplished by spending many of the episodes in the future, where we see the patterns of her past, future life as a cog in a militarized-police state. In Timeless, we also see that a dystopian conspiracy known as “Rittenhouse” acts as a shadow, deep state conspiracy from the very start of America and that these conspirators have existed from the beginning right up into the present. The 10-yo son of the founder clearly articulates in the theme of the show when he roughly states “Father says the peasants just go around and around like the hands of the clock. They can’t be trusted to control their actions or destiny. We are the clockmakers and we say how things work. Monarchs are too selfish and democracies are too chaotic.” Interestingly, there was a real life David Rittenhouse who was the first director of the US Mint and a clockmaker and astronomer. So how are we time travelers and how does this explain TA-65 dividing husband and wife? 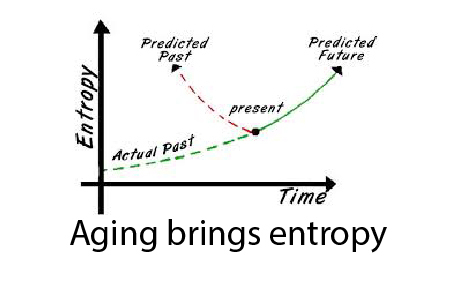 The interesting theme that is always central, sometimes with tongue-in-cheek pseudonyms the Timeless characters adopt in the past like “Wesley Snipes” and “Nurse Jacky”, or sometimes with not-so-subtle references to Terminator in the killing of parents of potential adversaries, is the rub between the “arrow of time” or the notion that changing one thing irreversible alters all downstream events and the notion of “Providence” or the somewhat stubborn and ironic persistence of would-be parallel universes to maintain the same outcomes and players despite efforts to the contrary. When it comes to taking a telomerase activator with the theoretical ability to enhance longevity yet the theoretical ability to increase cancer incidence, the notions of agency and responsibility come to the fore. If I am a man who has done hundreds of hours of due diligence and my wife trusts me, she may decide to take TA-65 along side of me. But if this is a second marriage or if there has been a rocky life-course, the spouse may not be totally on board and the husband (because it most often is the man in my experience) has the awesome responsibility of knowing that if their loved one gets cancer (as we all will) then there may be sense of guilt or proximate causation related to that decision. That is the problem with taking something like this. The people who did not do their own due diligence will receive a diagnosis of cancer, potentially blame the TA-65 and their spouse, and then abandon all hope to receive the carcinogenic therapies of radiation and chemotherapy. In the case of my golf buddy, he had a miniscule melanoma and attributed it to suntanning beds in his 20’s, deciding to not stop the TA-65 and is by all accounts, now cured. Would that lesion have disappeared on its own? Perhaps. But he didn’t let him turn against his original decision at the fork in the road years ago. In Bob’s case, the angel of death passed him over as his doctors wrongly assumed that a 78yo man would be dead from old age before he could “benefit” from chemo. Despite colon cancer metastatic to the liver, his surgery and his continued use of TA-65 is all that he needed to make his tumor marker levels return back to normal. I have another patient named Ray (also in his 70’s) who developed liver cancer while on cycloastrogenol and he found his own precision stereotactic nuclear medicine solution and removed multiple hepatocellular carcinoma foci. His tumor markers remain normal and he continues to use cycloastrogenol (the ingredient in TA-65). Finally, we have a gentleman who is 85 and developed a basal cell on his face and decided to treat it with natural remedies and not stop cycloastrogenol. If we think about the choices we make and why we make them, we are prepared for the consequences and not easily cowered by the perhaps unavoidable providence of fate when it hands us a cancer. Even better, if we understand that cancer may be occurring at a low level throughout life and that is probably helped, not hurt by a healthy immune system and avoidance of stem cell destroying chemotherapy, we may live to fight another day more robustly. In the end, the characters in time travel TV shows torture themselves over the consequences of their actions and the ability or wisdom of going back in time to alter events and ‘rescue’ loved ones. When a person realizes that we are all time travelers without “do-overs” moving at a speed of one day per day through our lives, we can accept responsibility for untoward events, whether they be of equal, lesser, or higher probability because of our actions. But to assume that risk for another person, even a spouse, is something that comes with too daunting a responsibility for many. For many of us, we have already accepted the fate of death, decay, cancer, and dystopia as the cost of being alive. Those people will never be open to the possibility of anti-aging because their religion is death. For those more intrepid time travelers among us who have already had the epiphany that the risk of death, decay, cancer, and dystopia is 100% in the absence of action, another path, even one fraught with potential unknowns, is at least one that is worthy of consideration if not outright enthusiasm. From a Vibranetics perspective I am exploring your teaching which your shared in your Hay House interview I listened to today and merging it with a Primal Trauma release process I created. It would seem that the same longevity results could be accomplished and improved upon with a microcellular energy healing of the telomerase. I am now exploring this idea.